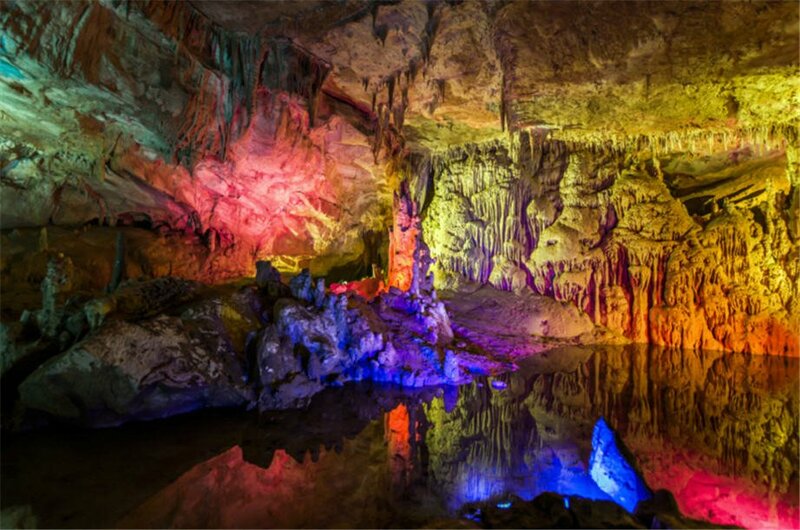 In this tour we will visit The Karst Caves in Kutaisi . Trip to Kutaisi, a city in western Georgia. Is Georgia's parliamentary capital from 2012 year.Located on both banks of the Rioni River, at an altitude of 125-300 meters above sea level. At 22 km from the city is located Kopitnari airport. Distance from Tbilisi railway, as well as on the motorway is 220 km, 100 to Poti and Batumi 150 km. First we will visit the Karst caves of Sataplia in western Georgia, in Tsqaltubo Municipality, 10 km from Kutaisi, in the north-west direction. The caves are located on the territory of Sataplia State Reserve. The absolute height of the caves varies from 275 to 405 meters. Rich in both flora and fauna. The area is located Colchis forests with relict and endemic plants, as well as traces of dinosaurs. In the reserve are two main interestingness: caves and dinosaur footprints. This is something that concerns the cultivated part of it. Still there is the crater of an extinct volcano and the Stone Age man in the parking lot of the White cave. . The name "Sataplia" can be translated as "honey" once lived wild bees, but have gone missing in these parts. Probably scared away tourists. Prometheus Cave is one of the natural wonders of Georgia and one of the largest in the world and has many underground rivers. It was discovered in 1984. Its unique features include a variety of rooms and landscape diversity. It was formed four different layers at different stages of development of the Earth, and visitors can take a trip through the historic area on foot or by boat. Prometheus Cave is one of the most popular international tourist caves, and includes different types of stalactites, stalagmites, curtains, frozen waterfalls, cave pearls, underground rivers and lakes. A cluster of six caves is significantly different from each other in size and unique shape of fossilized flowstones find. Golden Fleece cave meets all the requirements of international tourism level. Visitors can enjoy a boat tour on the 280 meters underground lake in the cave. Then we will go back to Kutaisi , have a dinner in restaurant , where we taste Georgian National Cuisine , Georgian Wine and travel back to Tbilisi .